Matthew Brolly wrote a brilliant debut released last year called Dead Eyed. It was a stunning debut and you can read my review for it HERE. You know when you love an authors debut novel, and you wonder if they can follow up with another cracking book?! With Dead Lucky, wonder no more! I raced through it, absolutely glued to my iPad at any reading opportunity as I was dying to know what was going on! But Lambert never expected to receive an anonymous call from the killer. This time, it’s personal: if Lambert doesn’t find the murderer soon, his own loved ones will be next. LOVED IT!!! 🙂 Honestly, I loved Dead Lucky! Almost from the first page, I was hooked! The story draws you in so completely and so quickly that you just can’t help but keep reading! DCI Michael Lambert is one of my favourite characters from the past 12 months. There is just something about him that I enjoy, which is testament to Matt’s writing style in that he creates great characters. It’s comforting to pick up a book with a main character that you like, it’s almost like meeting up with an old friend. Dead Lucky picks up after Dead Eyed, so Lambert’s situation has changed since the previous book. I’m not going to go into plot details, you can read my review to get an idea. Sufficed to say, there’s enough going on without picking up a murder investigation. Brolly has a masterful way of writing plots that reveal their secrets slowly, not enough to give you the full picture, but enough to tempt you to figure it out. I love books like this as they make you try really hard to figure out the ending, but then blindside you completely when it comes to the big reveals! I’ve no problem in saying, despite crime fiction being pretty much the only genre I’m reading lately, I’ve become useless at figuring out who did what and why! I think that’s why I enjoy reading books like this, they challenge my brain to work harder! Dead Eyed can be bought by clicking this link! 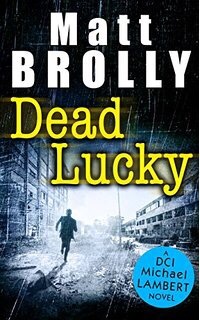 Dead Lucky, out January 11th, can be pre-ordered by clicking this link! Terrific review, Kate. I loved Dead Eyed and have Dead Lucky pre-ordered. So happy to see it’s a winner as well!!! Great post, I love how you review books and you’ve convinced me to put this on my to be read list for the year! Awh thank you! 😊 I hope you like it!